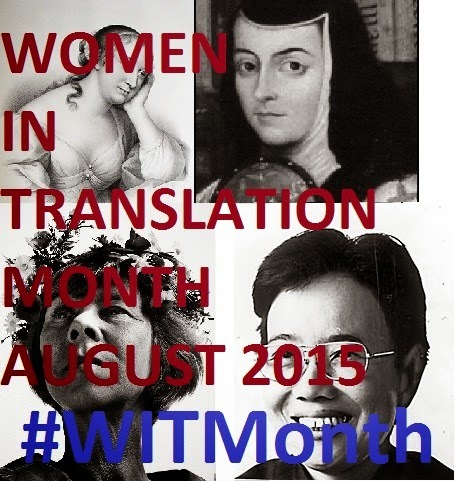 The sun is shining, the birds are chirping, the weather is getting extremely and unbearably hot (for those of us in the Northern Hemisphere)... must be time to announce Women in Translation Month, 2015 Edition! Like last year, WITMonth 2015 (still #WITMonth for those following on Twitter, mostly because it seems easier) will be taking place in August. This gives us three full months to prepare. Last year I noted that while it was incredible to see so many reviews, the books were largely very popular recent releases. I proposed - and now make official - a trickier challenge: reading older titles and less-known gems. I've been compiling (and will soon publish) a list of potential titles (with publications from the 11th century and on! ), and definitely encourage readers to explore some of these older titles a bit more. The challenge will be to read books written before 1960. Obviously these will be harder to track down and likely not to everyone's taste. If this challenge isn't to your taste, feel free simply to focus on women writers in translation. Another one of my personal goals last year was to broaden my general horizons. While I try to maintain diversity in my reading overall (so that I'm not simply reading books from France or Scandinavia), there are areas in which I could be doing better. As with last year, I strongly encourage readers to look beyond Europe. More so, I found it extremely difficult last year to locate titles by queer women writers in translation. My hope is to find a few titles/authors to showcase this year, though at this stage it's unclear which books precisely this will be. I'm open to suggestions. Like last year, this is a very, very open challenge. The idea is not to force yourself to read books you're not interested in, rather it's to give voice to so many women writers who perhaps get lost in the male-dominated field. Explore and experiment, read and delight. If you find yourself struggling with the challenges... don't do them. If you find yourself too busy to read any books by women writers in translation... it's fine, just join the discussion. This is a no-pressure event. Finally: The final 2014 Women in Translation Tally will be published in the coming days. I've spent a lot longer on it this year for a number of reasons which will be mapped out in the post itself, but suffice to say that despite growing interest in reading more women writers, there's still a long way to go in terms of the actual publication statistics. And this is the reason I find WITMonth to be so important: while of course we ought to be reading women writers in translation throughout the year, the difficulty in finding many of these titles is genuine, as is the general lack of availability. As long as such a striking imbalance exists, I will continue to encourage readers to take up this mantle every August. If only for a month to raise awareness and foster a discussion. And read lots of excellent literature, of course. I'll try to participate, although I have some I want to read before August, hopefully I will have a few for August as well, look forward to seeing the lists. Oooh, you tempt me, although I was planning to stick to my TBR pile for the foreseeable future. I'm sure I can find some women in translation there, though... Even before 1960. I am interested in reading Women in Translation this August. Off to search my newly arranged shelves for titles calling my name. Thanks for hosting! Surely I can read at least one woman in translation for August! Especially with my Japanese Literature Challenge currently running, and my never ending interest in translated literature. Looking forward to it! I am definitely in, I love reading women writers and also discovering new ones who wrote before 1960. Thank you for hosting!